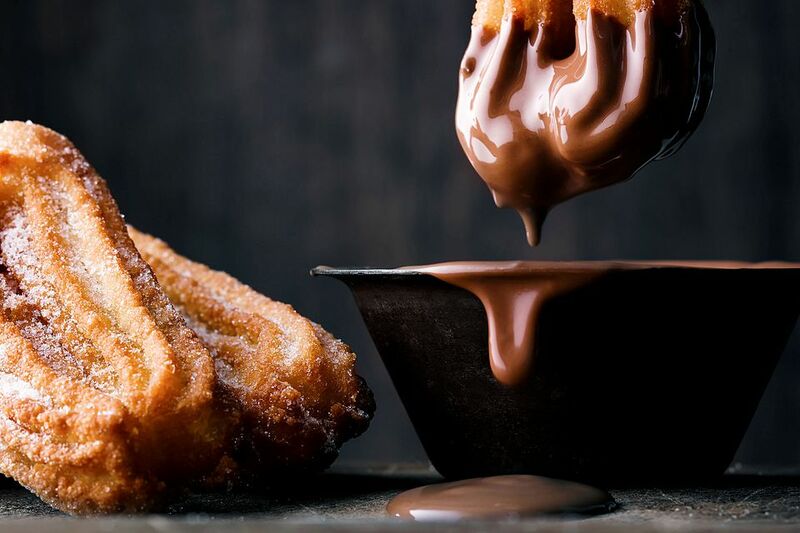 This recipe makes a delicious topper for your ice cream or a great dipping sauce for churros—and has many other delicious uses, besides. See our list of uses and variations of Mexican Chocolate Sauce below the recipe. Cacao was first cultivated by the indigenous peoples of Mexico, so it is one of the most Mexican of foods. Chocolate was used by ancient Mexicans as both a currency (cacao beans were “money”) and to make a bitter drink enjoyed only by the elite. This is a basic recipe, a starting place. Don´t be afraid to tweak the ingredient proportions according to taste and/or to the use you will give your chocolate sauce. Increase or decrease the sugar to your liking. Omit the liqueur, if you prefer. Use more cream for a looser, more pourable sauce; use more solid chocolate for a thicker sauce that will harden more upon cooling (for use as a ganache or for making chocolate truffles, for example). Microwave method: Place chocolate and heavy cream in a microwave safe bowl. Cook in microwave for a minute or so, making sure to stir every 20 seconds. Stop microwaving when mixture is smooth. Direct stove-top method: Place chocolate and cream in saucepan over low heat. Stir constantly until mixture is smooth. (Note: Be very careful when using this method, as a moment of inattention can lead to the chocolate´s burning). Hot water bath method: Place chocolate and cream in a metal bowl. Place the bowl in pan of very hot water in such a way that the water comes 1/3 to ½ way up the sides of the bowl. Stir ingredients gently until mixture is smooth. Stir in the cinnamon, coffee liqueur, and sugar. Pour into a serving dish and enjoy. Any leftover sauce can be stored in a tightly-covered glass jar in the refrigerator for a week or so. Reheat before using. What to Use Chocolate Sauce For? Whip it to make a mousse. Use dark brown sugar or grated piloncillo instead of white sugar for added flavor. Trade the Kahlua for another, less-well known, Mexican liqueur such as Guayacura Damiana, Agavero, Reserva del Señor Almendrado, or Kalani Coconut Liqueur. Play around with the spices used. Add a pinch of cloves or trade the cinnamon for a teaspoon of “pumpkin pie spice” (which is usually a mixture of cinnamon, nutmeg, ginger, and allspice). Use Mexican (the round tablets used in Mexico for preparing hot chocolate, such as Ibarra or Abuelita brand) instead of dark chocolate for a more rustic sauce. Cut the amount of ground cinnamon in half, as these products already include some spices.